This collection and dispersion of the continents is known as a supercontinent cycle, and the world now is 180m years into the current cycle. It is predicted that the next supercontinent will form in about 250m years, when the Atlantic and Pacific oceans both close and a new ocean forms where the large Asian plate splits. Because the plates move around, ocean basins change their shape and size. For example, the Atlantic is currently expanding at about the rate your fingernails grow (a couple of centimetres per year), whereas the Pacific is slowly closing. These changes in the ocean basins can have a very large impact on the tides over millions of years. This is because the tide moves around the oceans like a very long wave, with more than 1,000km between two peaks. The way this wave moves is largely controlled by the shape of the ocean basin and its depth, and if the ocean has the right size – if the length of a basin is half that of the wave, or “resonant” – the tides can become very large. Resonance can happen in any system that swings or oscillates if you force it at its natural period. For example, if you give a child on a swing a small push at the right time, they will swing higher and higher, because you are forcing them at the natural period of the swing. The period of the tide is set by the motions of the Earth, moon and sun – and the natural period of an ocean basin is set by its geometry. For example, today, the north Atlantic is very near resonance because these two periods are almost the same. This is why the tides in the Atlantic are much larger than those in the Pacific or Indian Oceans. But this has not always been the case. From experiments with computer models which can simulate the tides with great accuracy, we know that the tides were weak for long periods of the current supercontinent cycle, because the shape and size of the basins couldn’t support large tides. In fact, of the past 250m years, it is only the last 2m years or so that have seen large tides on Earth. Since we are approaching the halfway point of the supercontinent cycle, we asked ourselves a question: what will happen to the tides as the next supercontinent assembles in 250m years or so? Is it possible that there is a supertidal cycle linked to the supercontinent cycle? Using the computer model, we have now found that there is indeed a supertidal cycle linked to the supercontinent cycle. In fact, there are two: we are currently at the start of one “tidal maximum”, a period of time when the tides are very large. They will then weaken significantly, before briefly becoming large again in around 150m years from now. After that, the tides will again drop down to less than half of the energy levels they have at present as the next supercontinent forms. This will happen because the basins go in and out of resonance as their shape changes. The tidal maxima are brief in geological terms and only last 20m years or so. For most of the time, the tides are less energetic than they are today and, over the 400-600m years between the formations of the two supercontinents, the tides are only large for 50m years in total. Tides are a major energy source for the ocean: the energy pumped into the tide by the sun and the moon is lost, or dissipates, within the ocean. This energy helps stir the ocean – much like a spoon stirs a cup of coffee. In the same way as the spoon moves sugar and milk around in the cup, the tide can drive movements of nutrients, heat and salt between the deep ocean and the surface. Fluxes of heat and salt are key to the large-scale climate controlling ocean circulation and fluxes of nutrients help sustain biological production, especially in shallow seas. 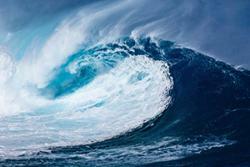 Changes in tides on any timescale can have large effects on the whole Earth system. While the changes described here may not have impact on us in the immediate future, it adds to our understanding of how the tides interact within various disciplines – including plate tectonics, the climate system, nutrient recycling and, eventually, the ocean’s ability to evolve and host life.